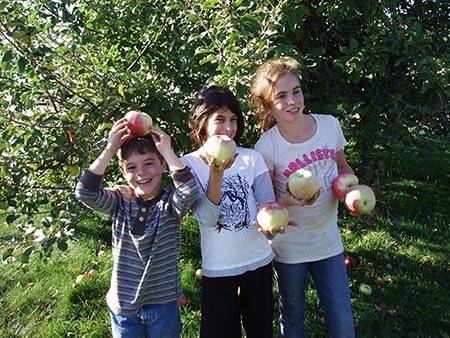 Alyson’s Orchard has over 50 acres of fruit bearing trees. From midsummer to late fall there is always fresh fruit ready for harvest at Alyson’s. With over 50 varieties of apples, 7 varieties of peaches, and many varieties of blueberries, raspberries, plums and pears, it’s a fruit lover’s paradise. Come treat yourself and those you love to a day of berry, peach or apple picking (when in season) and create a memory to last a lifetime. When it’s time to decorate for Halloween, remember that we also grow our own pumpkins, gourds and winter squash here at Alyson’s. We have a large selection of pumpkins for you and your your family to choose from. Later in October, the majority of our Heirloom apples are ready for harvest. Many of these tasty varieties are great “winter keepers” and will last for many months if stored properly. You will enjoy the tranquil beauty that Alyson’s has to offer from the picturesque views to the serene ponds. Visit the goats; let the kids enjoy our playground or play a game of bocce ball on our court. Purchase your pick-our-own bags at our quaint farm stand, where you will find a wide variety of locally made products and delicious treats for everyone. We are committed to the “Buy Local” concept and hope that you will join us by frequenting our orchard and enjoying the fruits of our labor.